You might have heard the news that Apple discontinued their Airport Router line recently. For a time Airport routers had distinct advantages in usability, and wireless Time Machine backups were once like magic. But now, Apple would have to build something an order of magnitude better than the last remaining Airport devices to compete with the likes of Synology. If you are looking for an alternative to Apple Airport Extreme, or Time Capsule, I recommend taking a look at Synology’s routers. This covers my experience replacing an Airport Extreme with the Synology RT2600ac. Synology RT2600ac: Best Non Mesh Router? Mesh Wifi is all the rage. While commercial mesh wifi has been around for some time, it is only in the past couple of years consumer tech has started to benefit. Mesh products have flooded the market, and savvy product placement has made the likes of Eero, and Netgear’s Orbi coveted home networking solutions. But, as much as mesh has become more accessible, it remains relatively expensive, and it isn’t always necessary. For a modest sized property, a decent stand alone router might even be a better option. Such is the situation I’m in. Knowing I don’t need mesh, I wanted to buy the best stand alone router I could find for non mesh wifi. Having gone with the Synology RT2600ac, I couldn’t be happier. I have never owned — or even used — a router even half as good as this thing. I’m no networking expert 1, but I know my way around the awful browser-based interfaces generic routers ship with. Where Apple Airport routers offered sharp relief from the abominable user experience of those devices, Synology routers go much further. 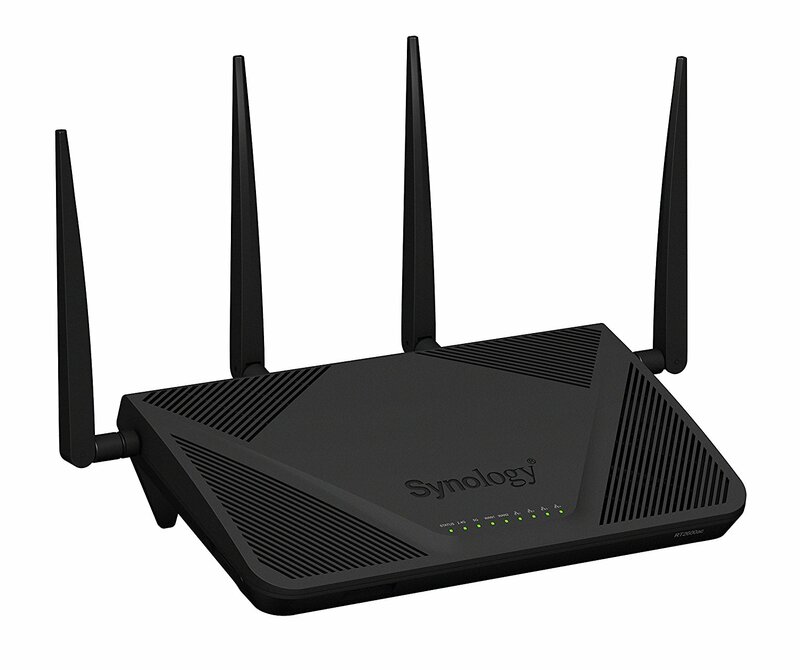 Both the RT2600ac, and the RT1900ac, benefit from Synology’s pedigree as a network storage provider. Which means you don’t just get an excellent, easy to use stand alone router, but also a mature ecosystem of app packages to extend its functionality. I wanted a network storage solution, but dropping more cash on a NAS drive at the same time wasn’t an option. The fact that Synology routers can double as a lightweight NAS is the big bonus for me. 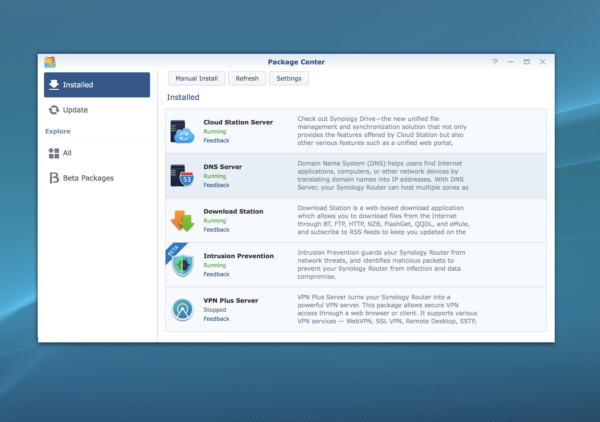 Synology Router Manager (SRM) has a number of features ported from Synology Disk Manager, including a package manager. If you attach a USB drive, or a high capacity SD Card, you can install and manage packages that include a VPN server, download manager, media server, and Cloud Station Server. Setting up a personal, private cloud is simple and it works very well. Wireless Time Machine backups were the killer feature of Apple networking. That was obviously the purpose of the Time Capsule base station, but the Airport Extreme could do it too. Having Time Machine on the network was extremely convenient, but the network storage capabilities are about as limited as it gets. Sure, you could set up file sharing, but it wasn't great in my experience. By contrast both Synology models can do much more with a drive, or two attached. Time Machine is where it starts, rather than where it ends. This is just one reason that a Synology router is less an alternative to Apple Airport Extreme, and more an upgrade. This is also huge, Synology even provide their own free service for dealing with dynamic IP addresses. I am in favour of cutting back third-party services wherever possible. This might be stretching the definition, but it means no more janky DNS updaters, or scripts to make my network accessible. Synology makes securing devices with SLL more user friendly than it normally is, and their Quick Connect service helps mitigate common problems with port forwarding and so on. All of which means I'm now living the dream of reliable external Plex access. It would be ideal for gamers who want to get on with things without becoming network engineers. Suggesting ‘your mileage may vary’ is more relevant than ever here, but the Wifi coverage I get from the Synology RT2600ac is so good that setting up a mesh system would go be overkill for me. Our place is pretty compact, but we have close neighbours for interference, and a long driveway. Yet I can walk out the gate before I’m kicked off the wifi, and there is nowhere inside our place the connection is not consistent. My admittedly unscientific tests include walking to the other side of our garage, which would make me roughly 30 metres from the house with two brick walls, double glazing and a car between the Synology RT2600ac and my iPhone. I still get 50% of the downstream bandwidth, and everything available going up. 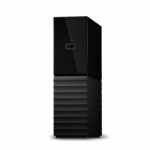 Bonus Tip: Best External Hard Drives for a Synology Router? This will depend, either on how much you’re willing and able to spend, or on what your goal for the network attached storage. If you’re looking for an Apple Airport Replacement, you will obviously want a decent drum of storage. The good news is this needn’t be an expensive exercise. I use Backblaze for peace of mind off-site backup. They have always been excellent, so I have every reason to trust their data and recommendations. Every year they publish a list of Hard Drive statistics. It’s a handy guide that can help you avoid buying lemons to put your data on. After pouring through the tables, I ended up getting a 4TB Western Digital Drive. If you like the idea of setting up the NAS capabilities of the Synology RT2600ac, one thing to be aware of is redundancy. Genuine NAS drives are configured in RAID arrays, with redundancy built in. You can get decent stand alone RAID drives from the likes of Western Digital, but do the math an you might as well look at the lower end Synology boxes. 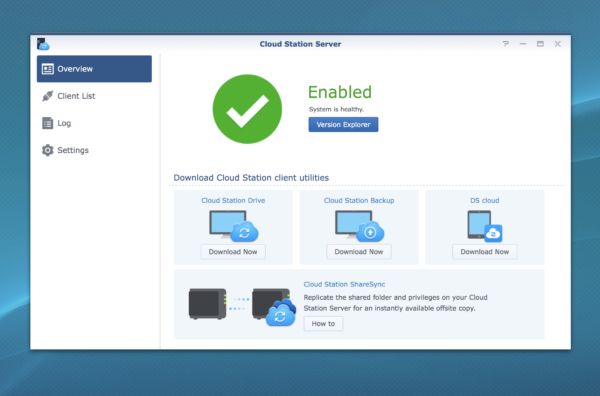 Luckily, another great feature that Synology router’s can tap into is cloud backup. Again, I use Backblaze for this, utilising their low cost B2 storage with Synology’s Cloud Station Backup. The way I see it, if a drive fails I’m covered, and with any luck that won’t happen before I’m in a position to upgrade to a full blown disk station NAS. Apple recently published a Support article with information for a Wi-Fi router to use with Apple devices. Some of what it contains is best practice advice, so they’ve been a little loose with the meaning of ‘essential’. Nonetheless, if your looking to tick all those boxes the Synology RT2600ac will do that for you. So will the earlier model, the RT1900ac for that matter. I have very rarely been so happy with a piece of hardware, and never ever felt compelled to write about a router before.